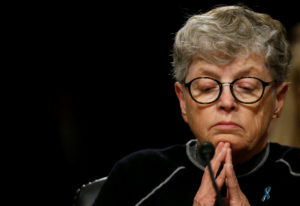 LANSING, Mich. — Former Michigan State University President Lou Anna Simon was charged Tuesday with lying to state police during a probe of Larry Nassar’s sexual abuse — the fourth person other than the imprisoned ex-campus sports doctor to face criminal charges related to the scandal. Simon, who stepped down earlier this year, was asked by investigators in May if she was aware of any investigation involving Nassar before 2016. She said she knew in 2014 that a sports medicine physician was the subject of review. The charging document, however, says she knew it was Nassar. It also accuses her of falsely stating that she was unaware of the nature of the sexual misconduct complaint that was being investigated. The Associated Press left a message seeking comment from Simon’s attorney. If convicted, Simon faces up to four years in prison. She is the third former university official to face criminal charges related to Nassar’s serial molestation of young female athletes under the guise of treatment. In Texas, a grand jury indicted a former sports medicine trainer. Numerous other people have lost their jobs or been sued.